This is a silver grosso minted under the tenure of Giovanni Soranzo, the 51st Doge of Venice who served from 1312 until his death in 1328. With iconography and style inspired by the Byzantine aspron trachy, the Venetian grosso was introduced in 1193 by Doge Enrico Dandolo. Dandolo's introduction of the grosso was due to an influx of silver brought about by the role of Venice as the provider of ships and transportation for troops to the Levant during the Forth Crusade. It was also seen as a way of lowering minting costs as well as a way to fill a growing need for a high value, and more pure (98.5% Silver), currency for High volume trade to replace other staples such as the long used but smaller Carolingian denari, Byzantine coinage that had become significantly debased, and the coins of the crusader kingdoms that were no longer an option after the conquest of Jerusalem in 1187. By the 14th century the Venetian grosso had become a major trade currency that was, according to Martino da Canale, "current throughout the world on account of its good quality." Because of its stellar reputation the grosso was often copied and counterfeited, especially in the Balkans. In order to make trade easier, Constantinople began to mint the basilikon with the same weight and silver content as the grosso to make the two currencies interchangeable. The name grosso is a derivative of the French Denarius Grossus (grossus meaning thick). This is the basis for many variations of the name used in different languages, in both the West amd the East, to denote a thick silver coin and later as a general denomination. Names such as the Grosso (Italian), Groat (English), Grote (Dutch), Gros (Czech) and Groschen (German) in the west, as well as the Qirsh (Arabic), Gersh (Amharic), Grush (Hebrew) Grosi (Greek) and the Kurus (Turkey) in the east. 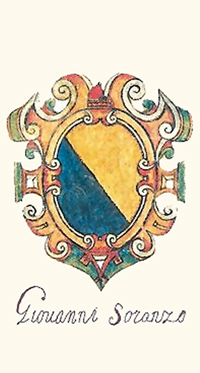 Giovanni Soranzo: The tenure of Doge Soranzo is represented by Alethea Wiel, author of Venice: The story of Nations, as a "bright epoch" in Venetian history. When Soranzo came to power, he inherited a Venice that had become stagnant and was at war with the city of Zara. Zara was a former vassal that broke with Venice and allied with Hungary but was reconquered and sacked by Venice in 1202. According to Horatio Forbes Brown, in his book Venice: An Historical Sketch of the Republic, Zara was not happy under Venetian rule and rose in revolt. Although Soranzo was able to reestablished Zaran compliance during his rule, Hungary would later regain control of the city in 1358. Under Soranzo, the interdict placed upon Venice as punishment for the Ferrarese War was removed with a payment of 100,000 florins and all rights and privileges in Ferrara were restored by 1317. He also established or reestablished commercial treaties with Milan, Bologna, Brescia, Como and Recanti. Under Soranzo Venice set up a prosperous trade circle by trading sugar for wool in London which they took to Flanders where it was turned to cloth and brought back to Venice. The cloth was then distributed across the Dalmatian coast and into the Levant where they would gather the sugar to start the cycle anew. This greatly increased trade revenue. Along with increased trade in wool, Venice also began to participate in the silk trade assisted by exiles from Lucca who brought with them the knowledge of silk weaving. The manufacture of looking-glasses also became a major industry within the city under his rule. With greater success came greater standing with foreign princes. Edward III of England requested the aid of Venetian galleys to assist in his war against Philip of France in exchange for extensive privileges and offered to host the Doge's sons at the English court. King Charles of Hungary offered favorable terms for commerce with Venice and similar terms were reached with Andronico, Emperor of Constantinople, as well as the Sultan of Tunis and with Trebizond. Because of the increased trade and industry, he also oversaw a rapid rise in the population of Venice to an estimated 200,000 inhabitants. 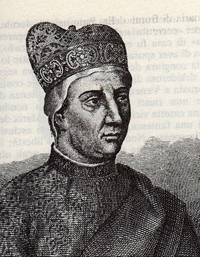 When Soranzo died on December 31, 1328, Venice was arguably more prosperous, enlarged and it was reported that under his sway "The well-being of the city was so wonderfully enhanced" and that he had "neglected no means to add to the beauty of his city and the prosperity of his people."